A Bromley man has been prosecuted after removing asbestos without a licence and doctoring a report that told owners of a home in Camden he had safely cleared the site. Southwark Crown Court heard yesterday that Peter Horrey, director of Bromley firm Absolute Asbestos, was unlicensed to remove asbestos, and failed to properly clean and decontaminate the boiler room of the home in Greencroft Gardens. Visible fibres remained which were a hazard to householders and to plumbers due to start work in the room. An analyst then took an air test and gave Mr Horrey a certificate showing the site had failed. Mr Horrey then doctored a report to the owners, telling them it was safe to enter, which they subsequently did. Mr Horrey had previously pleaded guilty to three breaches of the asbestos regulations and was given six months’ prison sentence on each charge, to run concurrently and suspended for two years. He will also serve 300 hours’ unpaid community services, will pay £11,340 to the Residents’ Association, and will pay £10,160 in costs. He will also be given an electronic curfew between 9pm and 6am for three months. The Health and Safety Executive investigated the case and inspector Dominic Elliss said he was appalled by the reckless disregard for safety. Around 4,000 people die each year in the UK as a result of breathing asbestos fibres. 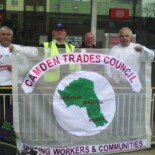 This entry was posted on September 17, 2012 by CAMDEN TRADES COUNCIL.